Swordfish is meaty and mild, but nowhere near bland. It's a fish that can be coupled with some serious flavors without being upstaged and without clashing. Enter balsamic. The sweet, tart vinegar is not just for salads. Added bonus: it reduces beautifully, turning into a thick and drizzle-able syrup. The rich and glossy balsamic, the artfully shaped hearts of palm and the strikingly bright red tomatoes make this dish a stunner. Pretty foods just magically taste better and, given the expanded color palate of fruits and vegetables, they're usually better for you too (as long as we're excluding anything made by the Cake Boss or featured on Cupcake Wars- because those are 5000 calorie works of art). This swordfish steak can be prepared on the grill or under the broiler in the oven. I've rarely had trouble with swordfish drying out, I assume because of its natural oiliness. However, salmon is even oilier and can become bone dry when left cooking for just 30 seconds past perfect doneness, so who knows? Marinate swordfish in one tablespoon of balsamic vinegar and the juice from one half of the lemon for 30 minutes to two hours, but not much longer than that. Preheat your oven's broiler on high for ten minutes prior to cooking the swordfish. Pour the remaining 2 tablespoons of balsamic vinegar and half a lemon's worth of lemon juice into a very small saucepan and reduce until syrupy over medium heat. It will continue to thicken as it cools down so if it has reduced in volume by half, let it cool and check the consistency. Set aside. After marinating the fish and and preheating the oven, place the swordfish steak in a small, greased, oven safe dish. Sprinkle salt and pepper over the top of the steak and broil for 5 minutes on this side. Meanwhile, begin to sauté kale and hearts of palm in a lightly greased sauté pan over medium heat. Add salt and pepper to taste. Sauté until kale is wilted and hearts of palm begin to lightly brown, then remove from heat. When your swordfish is ready to flip, add tomatoes to the baking dish and sprinkle the uncooked side of the swordfish with salt, pepper, half of the basil and all of the capers. Return to oven and broil for another 5 minutes or until steak is opaque throughout and has a center temperature of about 145 degrees. 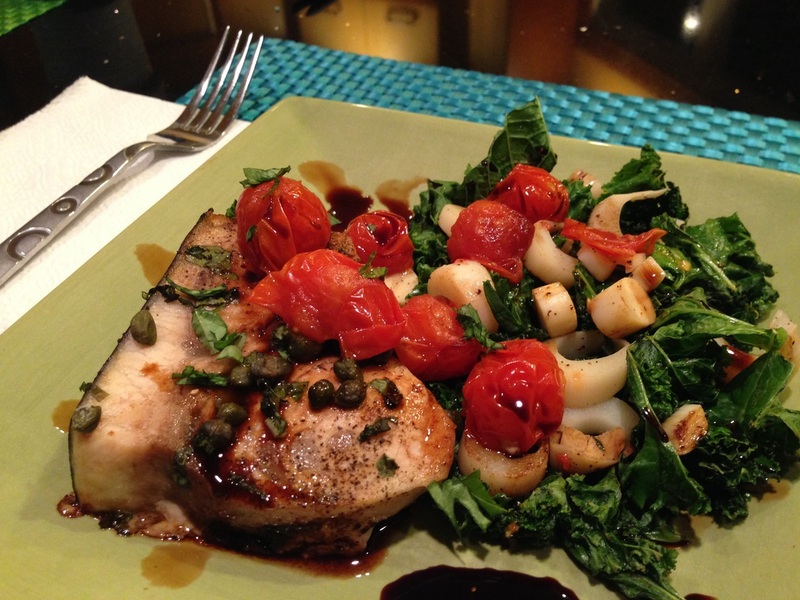 Serve swordfish next to kale and hearts and palm, topped with the tomatoes and finish with a drizzle of the balsamic reduction and a garnish of basil and lemon zest.